Bringing in a new twist to your regular game of Blackjack is Hi-Lo Blackjack. This add-on feature lets you bet on the value of the second card to be dealt by the dealer. You may either bet it to be of a higher value or lower value of the first card. While this does not impact the actual game, it adds on to your winnings and has a significant impact on the game’s RTP as well. Developed by NYX-Realistic, Hi-Lo Blackjack is a result of the partnership of two game developing companies. The duo came together in February 2015 and has been giving out the best mobile casino games since then. Hi-Lo Blackjack is your usual game of Blackjack with a welcomed twist. There is nothing complicated about this add-on. The Hi-Lo bet feature simply adds fun to the game. With the usual six decks of cards and the bets, the game goes on as you would know. Select the chips depending on the value of bet you want to place, and also the bets you wish to play. Once done, hit the DEAL button to begin the game. 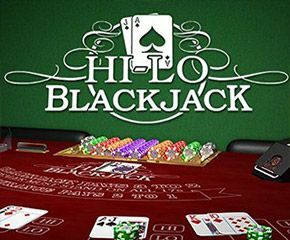 Hi-Lo is one of the bets you play during Blackjack. Here, the player gets a chance to bet on the value of the second card that will be drawn by the dealer after the first cards have been placed on the table. Now, the player either has to choose high or low, that is, you have to guess whether the second card will be of a higher or a lower value than the first card. If you guess correctly, then you get paid for it immediately. The other winning scenario is when the total of 21 is achieved in the second card itself. A Push occurs if the first card was an Ace, and the second also appears to be an Ace. The player will lose the bet if the second card is an Ace while the first one is not, or if the guess is incorrect. Once the Hi-Lo bet is over, the regular game of Blackjack resumes. Getting a total of 21 or closer to it is the objective of the game. With the RTP of 99.92%, Hi-Lo Blackjack is an amazing version of the regular Blackjack. If you are looking for some additional fun in your favourite casino game, then this is the right game to invest in.